Puerto Rico may finally see its first cubesat launched into space, thanks to a collaboration between the Interamerican University on the island and the Florida Space Institute (FSI) at the University of Central Florida (UCF). 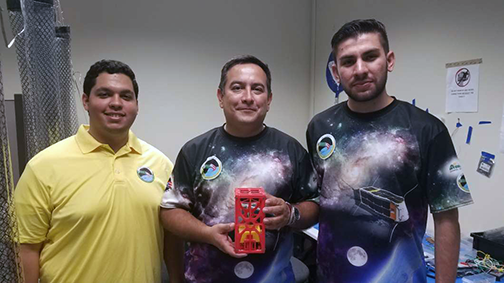 Interamerican aerospace engineering Professor Amilcar Rincon Charris and two of his students recently visited UCF to consult with UCF faculty and students about the construction of the miniature satellite called Puerto Rico CubeSat NanoRocks-2. Rincon said that Interamerican University has been wanting to put a cubesat into space since 2013 and now with this partnership with UCF, the reality of this occurring is really close. Interamerican University's Alexander Matta (L), Professor Amílcar Rincón (C) and Gabriel Cascante (R) with a prototype of the Puerto Rico CubeSat NanoRocks-2. Photo is courtesy of Brendan Byrne / WMFE. Rincon met FSI associate researcher Julie Brisset last year after UCF became the lead organization managing the Arecibo Observatory in Puerto Rico. Brisset has worked on several NASA cubesats by preparing payloads, such as the NanoRocks project, which flew on the International Space Station for more than a year. Smallsats are now launched by private and public companies as well as NASA provide scientist an inexpensive opportunity to conduct experiments in space. This cubesat, which will study the role of dust in planet formation, is another example of the kind of growing impact UCF is having in space research, especially when it partners with other groups across the globe. Brisset this week was awarded a NASA grant to fly an experiment aboard a flight from commercial provider Blue Origin. Assistant Professor of physics Adrienne Dove is waiting to see her cubesat launch from California and physics Professor Josh Colwell has another in the final stages of completion. For Rincon, the project been a long road paved with challenges and opportunities for his students. 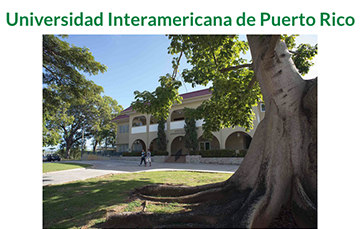 About 40 students from Interamerican have worked on the project through the years. They include students majoring in mechanical, electrical and computer engineering as well as communications. Many of Rincon’s students have graduated and gone on to work for companies such as Honeywell and Florida Turbine Technologies, which have operations in Puerto Rico. 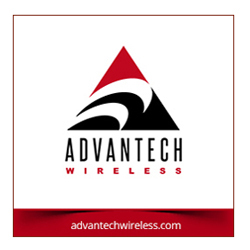 One recent graduate is working at the Kennedy Space Center. Currently, 15 students are working on the project that is set to launch in December 2019. There’s been another bonus for the current students on the project. At least two of them were able to visit Florida for the first time and UCF aerospace engineering major Jacob Kirstein visited Puerto Rico for the first time. 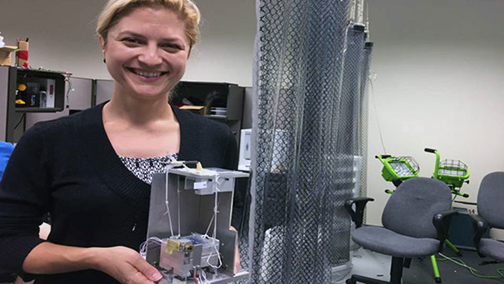 UCF Florida Space institute research scientist Dr. Julie Brisset holds a prototype of the cubesat being built by the Interamerican University in Puerto Rico. Photo is courtesy of WKMG. Brisset and Kirstein traveled to Bayamon this summer. They shared lessons learned from UCF’s previous projects. This week Rincon and his students are at UCF to go over design plans and talk about potential challenges in the construction of the new cubesat. Rincon said he builds an environment in his classroom and lab that mimics a company at which students are split into teams and given assignments. This UCF collaboration adds an international dimension to the realistic environment necessary to ensure his students can land jobs after earning their degrees, he said. UCF students are benefiting, as well. Students who have worked on previous cubesat projects have gone on to land jobs with NASA, the agency’s Jet Propulsion Laboratory (JPL) and many private space companies. Rincon said that the Interamerican University students are building the cubesat itself, and Julie and her team are building the scientific payload. Once the teams were developed, NASA approved funding as part of the Launch Opportunities program. Now this really happening. This will be historic and all are excited to see this project succeed and have Puerto Rico’s first satellite in space. Brisset noted that this is a great project as it's taking advantage of the strengths of both sides. Almicar and his students are working on the vehicle and the UCF team is working on the science payload where there is some expertise. The biggest winners are all of the students. Cascante and classmate Alexander Matta, have been working on the project about five months. The team initially assembled in August 2017 after hearing about Rincon’s project, but hurricane Maria put a stop to everything, at least for a while and Matta added that the team didn’t have electricity, water, nothing. He didn't have light until a few days before New Year’s. Everything kind of stopped but all is back on track now.